The goal of the GREATER campaign is to reach more broken people with the hope of Jesus. To realize this goal, we will raise funds to move to a new, larger facility. During the GREATER campaign, money will be raised by Mosaic people committing to a greater sacrifice – above their normal giving – for the next 25 months (December 2017 to January 2020). Update: Mosaic committed over $2.7 million to GREATER! We are currently out of space in some services, and the growth continues. Our mission is not to become a big church. It is to reach people who are far from God and do church in a way that is applicable to them. We simply need more space to accommodate more people. Mosaic purchased an existing building that needs extensive renovations. 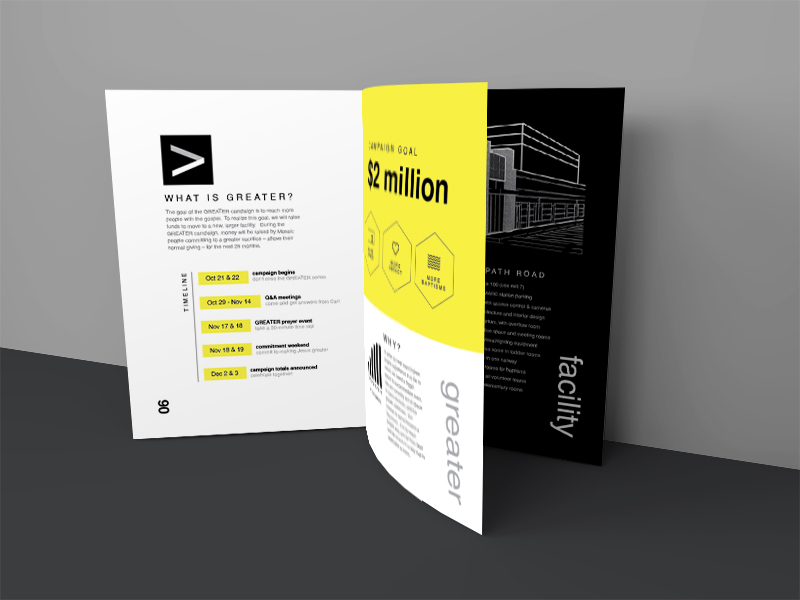 The GREATER campaign will raise money for the renovation costs. Work will begin as soon as possible in 2018, and the first services at the new facility will be held by the end of 2018. Mosaic committed over $2.7 million! Thus, will be in great shape financially and won’t need to change how we do ministry. In fact, our mortgage will be the same proportion of our costs that our rent is currently. 6845 Deerpath Road is the new building location. It's visible from Route 100 (we'll use exit 7), and we will use Dorsey MARC station parking. Professional architecture on the outside and inside provide a big transformation from the building's current state. Deerpath will be equipped with top-notch features: access control and security cameras, excellent audio/visual/lighting equipment, and professional interior design to make everything look and feel great. The total project cost is $9.7M, including purchase price of $3.8M, renovations, furniture, and audio/video/lighting equipment. The GREATER campaign will raise money for the renovation portion of the cost. The word “sacrifice” means to willingly give the best you have for a greater purpose – to give up something you love for something you love more. You should give to see lost people come to Jesus and to see Jesus become greater in your personal life.